Oyster Bay Town Supervisor Joseph Saladino and the Town Board today announced that the Workforce Development Board has secured a $125,000 grant through the New York State Department of Labor to assist dislocated workers with job training in a new field. Dislocated workers are individuals who are unemployed and have lost their job through no fault of their own, or who have received a layoff notice and are unlikely to return to their previous occupation. 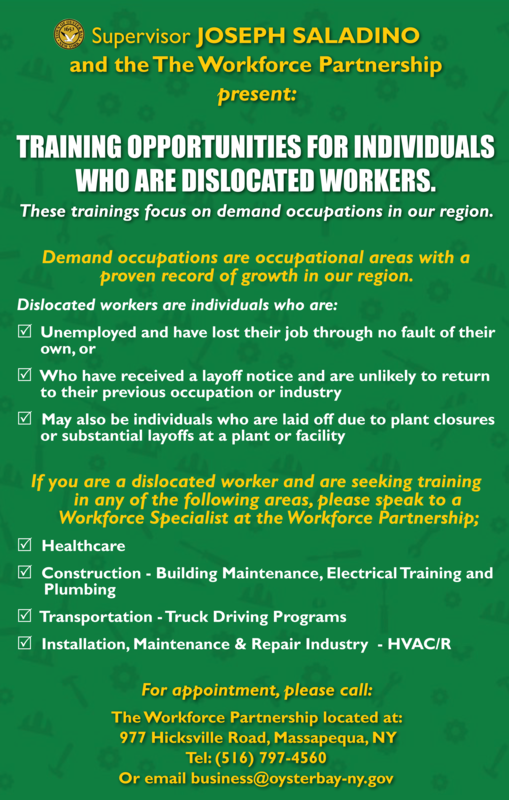 The job training program for dislocated workers will focus on the employment opportunities in the following fields that have proven to be in-demand occupational areas that have demonstrated growth in our region: health care; construction (building maintenance, electrical training, and plumbing); transportation; and installation/maintenance/repair in the HVAC industry. Training will be provided by vocational schools. The Workforce Development Board will also assist with supportive services and job placement assistance in conjunction with the vocational schools. For more information on the program or the Workforce Development Board, please contact the Massapequa Career Center at (516) 797-4560 or business@oysterbay-ny.gov.